What is a trigger finger or trigger thumb? What is the cause of a trigger finger or trigger thumb? Can more than one finger are affected? A common symptom of trigger finger or thumb is a snapping when attempting to extend the finger or thumb from a flexed position. In many cases the snapping or clicking is painful. Tendon entrapment of the thumb or finger is a common cause of hand disability and pain. It locks the finger or thumb in a bent position. This disease occurs in about two out of three cases as classic snapping. In some cases the affected finger or thumb feels (painful) stiff, particularly in the morning. Severe cases show the finger or thumb is locked in a bent position unable to straighten without help of the other hand. Contraction of the finger middle joint may occur. Triggering of the thumb or digits occurs most often in middle age. More than one finger (or thumb) may be affected at a time. In some cases, however, no snapping or popping exists. In such cases the patient suffers from distinctive pain, when stretching finger. This symptom is very distinctive especially in the morning. The patients have difficulties to close the fist completely or to stretch fingers or to enforce the fingers. The whole hand feels stiff especially in morning. Please compare it in the illustration. In normal in the tendon-sheath is little bit fluid. The tendon glides smoothly within the sheath. 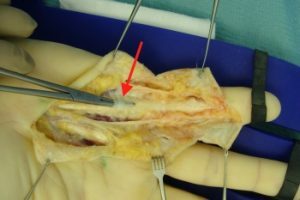 But, if the tendon-sheath is a narrowing, the tendon cannot glide through the sheath easily. The flexor-tendon may become inflamed and swollen. 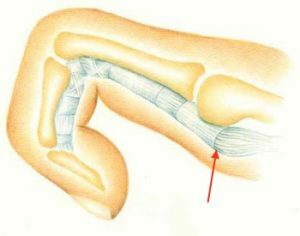 If the sliding resistance of the flexor tendon – by a strong effort of the extensor tendon – overcome, so the finger snaps into the extended position! Often the patients reported that the snapping an unusual effort was preceded by: (eg gardening, wear long, long bike or motorcycle driving, intense tennis or golf …) Repetitive trauma is often a direct pressure to the area in the palm, where the A1-pulley is located. Diabetes mellitus also can cause trigger finger. Triggering of the thumb or a finger is more likely to occur following surgery for carpal tunnel syndrome. Yes! Unfortunately, this is by no means rare. It can be used simultaneously several fingers are affected, as later, another finger also suffer. The picture is taken during a different operation. I do it for patient information. The instrument is between the A1-pulley and the flexor tendon. Please, be not concerned, if you are affected by trigger finger. The photo is taken by an operation of Dupuytrens disease and not during an operation of a trigger finger. The incision during the operation of a trigger finger is so small, that it less useful for instructional purpose. In typical case with symptoms of soreness at the base of the thumb or finger and painful snapping or clicking when attempting to extent the finger (or thumb) diagnosis is easy. (And is often made by the patient itself). A trigger finger (or thumb) is usually more painful at night and into the morning. Diagnosis is based on clinical examination of the hand. The affected thumb or finger is typically swollen in the region of the A1-pulley (At the base thumb or finger). In some cases the doctor can feel a nodule in the tendon. In long lasting cases the middle joint of the affected finger could not fully stretched. An X-ray of the hand or blood tests are seldom necessary. For example such examinations are useful in rheumatoid patients with trigger finger. Because there is a greater risk for developing a trigger finger if you have diabetes or hypothyroidism, some doctors perform blood test of these associated diseases routinely.